After all the open shifts have been closed and you are ready to close the store only then should day end be exercised. The Batch out or Day end is a way of telling the software that the store is being closed, all the shifts have been closed and every user has clocked out. This prepares the software for the next day. When the day end is completed, the software is ready for a new day and starts the next day with a new shift. At the end of batching out, a day end receipt is generated which provides you with the income summary, expenses, and other important details regarding the sales throughout the day. Note: You need to close all the shifts before ending your day/ Closing the batch. The batch information will be shown in the Batch closing window inside the blue box located at the top left corner. The batch open date, time, user it was opened by and the total sale will be shown. 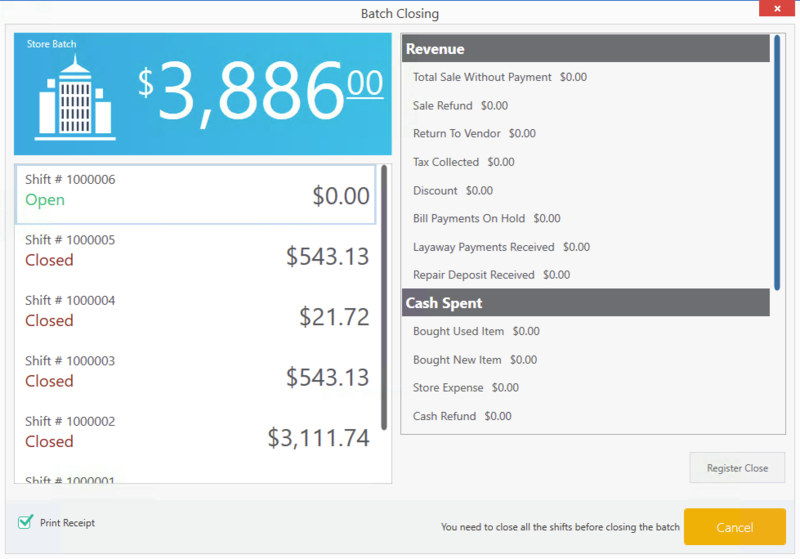 You may click the box to view the batch summary including revenue, cash spent, payment broke down and the tax collected. Right click anywhere inside the software to open quick links. Select the End Day quick link, the second last option from the bottom. Enter the user password and press enter. Click here to learn how to close shifts. Once all shifts have been closed you may click on the Day End button, and the Batch out receipt will be printed, your register will be closed and the software will open a new shift starting from a new day. To view each shift income summary, you may click on each shift and its summary will be available on the right side of the window. You may also reprint the shift receipt by clicking on a shift and clicking on the Reprint receipt button.